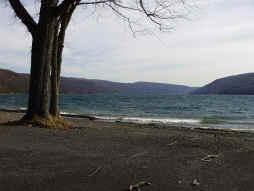 Skaneateles Lake is the most oligotrophic of New York State's Finger Lakes with characteristics typical of oligotrophic water bodies, including increased dissolved oxygen concentrations with depth, and high transparency levels. Skaneateles Lake has a rich blue-green color because the lake waters are quite clear, which allows blue-green wavelengths of light to penetrate deep into the lake. For more information visit the Skaneateles Lake Watershed site.